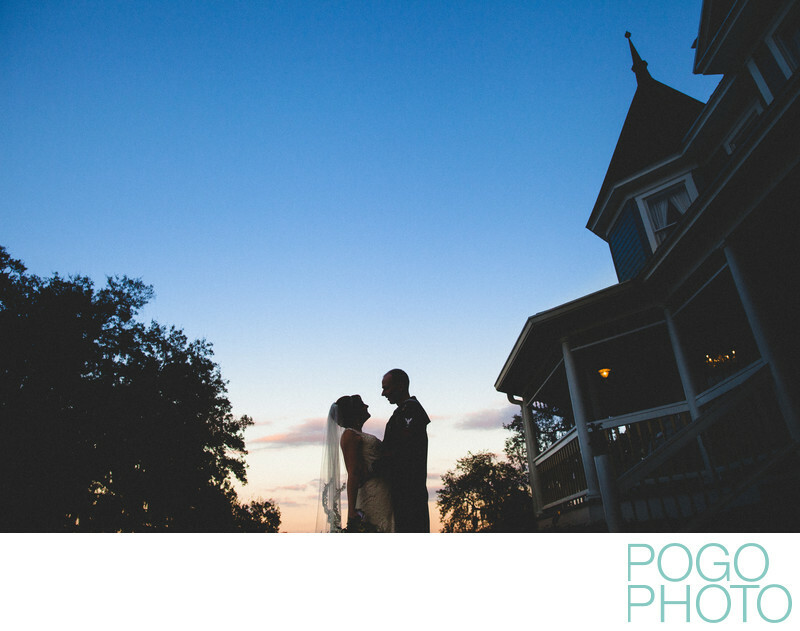 We took this silhouetted couple portrait as dusk descended onto Highland Manor in Apopka, FL during a leap day wedding. Central Florida is home to some of the largest tourist attractions, convention spaces, and hotel complexes in the United States, but just a short distance outside of the main population centers are large swaths of farmland and pastoral acreages. The city of Apopa itself is not exactly a small town anymore, as the population there has nearly doubled in the past twenty years, but places like Highland Manor provide the feel of a sprawling homestead despite being located at the intersection of the two largest thoroughfares in the area. Apopka’s nickname is “the indoor foliage capital of the world,” which we find amusing as Vermont is our summer and fall home and is known for its outdoor foliage, especially when those leaves change color. We find Apopka to be in the sweet spot between urbanized Orlando and the Old Florida feel evident just a few miles away. We chose to have the couple silhouetted against the sky to bring in the fading blue color and to use the graphical elements provided by the surroundings. Shot from a low angle, this image draws your eye to the couple first despite being flanked by the century old mansion one one side and a giant oak tree on the other. Highland Manor has a plethora of stately trees scattered across the estate, but we chose to incorporate this particular oak since the couple was married under its branches just a few hours prior. Working as a team comes in handy when capturing images like this, since one of us can direct and photograph in a certain style while the other is permitted to back up, lay down, and try something completely different. Portrait time is often limited as events of a wedding day seldom operate strictly within the timeline, so expanding the variety of pictures shot in a shortened amount of time is essential. Even with just a brief discussion, the two of us can work in complementing styles from different angles in an efficient manor, minimizing the amount of time the couple is away from their guests. Sometimes the couple wants a little breathing room and time away from the festivities, and we are more than happy to provide that welcome distraction as we are enabled to capture even more of the images we love. Highland Manor has watched Apopka grow into a city of 45,000 people over the last 109 years, and Apopka has watched the Highland Manor grow into one of its most popular wedding venues over the last five. Em appreciated the architecture of the mansion, as it is reminiscent of man southern plantations in the deep south. Em attended school in Savannah, Georgia, at the Savannah College of Art and Design, which helped her appreciate the charm of the deep south both through experiencing the culture first hand and studying the history of its buildings. We both love that Highland Manor offers multiple locations for ceremonies, both indoors and outside, and we embrace the myriad of locations we can use all day long. A long entranceway passes by a large pond, both of which separate the estate from the main road, mitigating the noise level produced by traffic. This separation also allows for beautiful views of the building from a distance while still remaining on property. Sometimes overlooked aspects of a wedding venue, including ample parking, onsite catering, and easy road access, are all present here without overwhelming the ambiance. We have photographed in many different locations across the US, and we found that Highland Manor excelled wonderfully in updating a dated space while never impeding on the integrity of its personality and charisma. While Apopka is far enough away from our Jupiter home to require a travel fee, we feel our personalities and style are a perfect match for Highland Manor. Location: Highland Manor, 604 E Main St, Apopka, FL 32703. 1/1250; f/4.0; ISO 800; 24.0 mm.